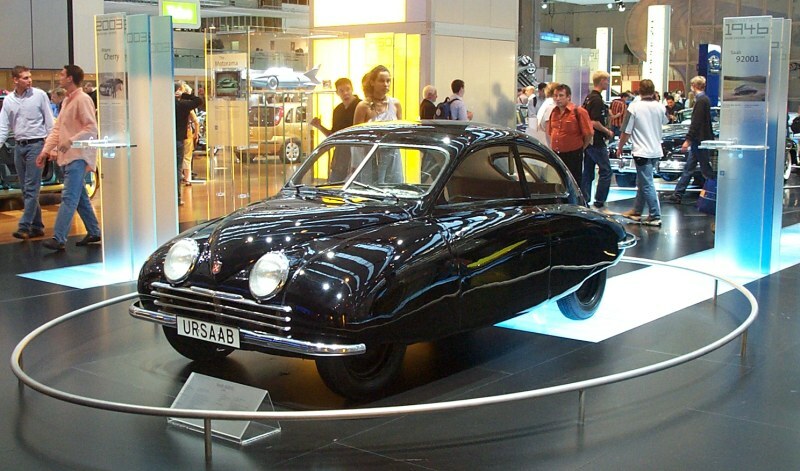 The Ursaab (original Saab), also known as 92001 and X9248, the first of four prototype cars made by Saab AB, (which at that time was solely an airplane manufacturer), was unveiled to the public on this date in 1947 at Saab AB’s headquarters. 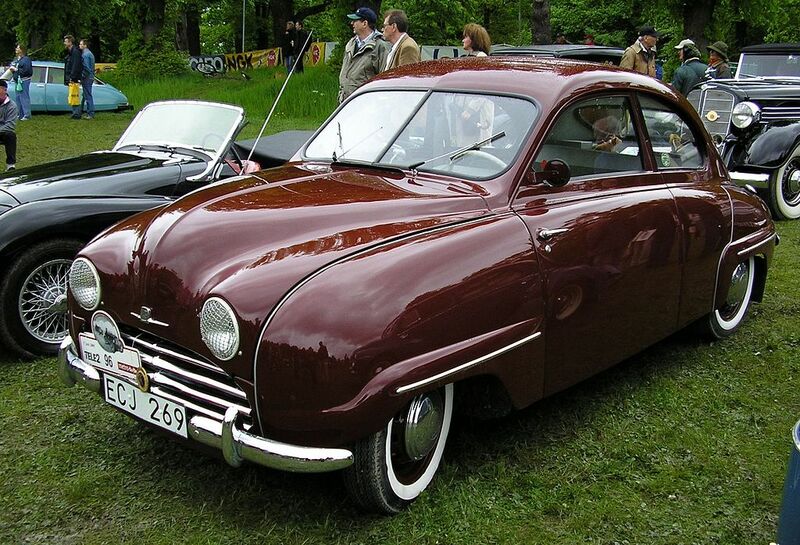 It led eventually to a production model, the Saab 92, in 1949. A little glimpse into the creative engineering that went into the prototype helps explain why Saab proved so successful over time. Trump recently railed against Germany for unfair trade practices for exporting its (superb) cars to the US, yet does not import US cars into Germany. Sweden could equally well be accused of making great cars, as could Japan – and not importing US models. In my humble opinion, US car manufacture was at one time revolutionary, but now simply cannot compete in the global market because the big US car companies have, for a long time, had no interest in advancing their technology. Henry Ford revolutionized factory production in general with the moving assembly line, and blew away the competition . Industry was changed forever. But then US car manufacture rested on its laurels while new car companies with new ideas sprang up in Europe and Asia, especially in the postwar years, while the US just looked on and said how unfair it all was. This is how Saab did it. 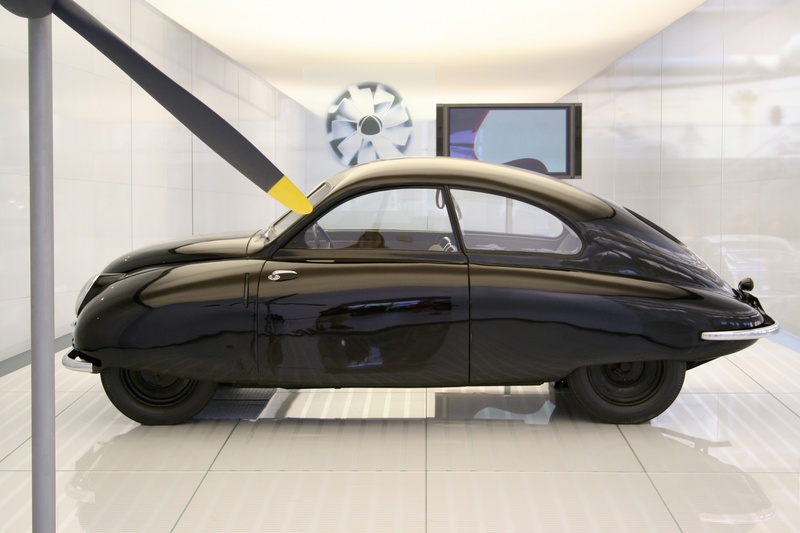 Saab AB, a manufacturer of warplanes, started an automobile design project in 1945, with the internal name X9248. The design project became formally known as Project 92; the 92 being next in production sequence after the Saab 91, a single engine trainer aircraft. The aim was to design a car that would compete with small German cars like Opel Kadett, DKW and Adler. The target consumer price was 3200 Swedish kroner. Bror Bjurströmer, who was then head of the design department, developed a 1:25 scale sketch and the overall design specifications, which included the following: a wheelbase of 2.75 meters (108.3 in) and total length of 4.5 meters (177.2 in); employment of a monocoque (single skin) design; 50% less drag than other cars; 800 kilogram maximum weight; power from a transverse-mounted two-stroke engine; and front-wheel drive. The choice of rear-hinged doors was made by Gunnar Ljungström (head of the development team) as he wanted to lessen the risk of damaging doors whilst driving out of a garage. The company made four prototypes, 92001 through to 92004, before designing the production model, the Saab 92, in 1949. Development was started in Linköping by a 16-person team led by engineer Gunnar Ljungström and designer Sixten Sason. The immediately preceding Saab production code was for an aeroplane – the Saab 91 Safir. It was for this reason that the first car project was called the Saab 92. Normally the development would have been handled by the testing workshop, but it was busy with the Saab 91 Safir and the Saab 90 Scandia. Thus the tool workshop, which had a lighter workload at that juncture, was given the assignment. The engineers responsible for making the prototype had no prior experience in making cars, and out of the 16 engineers only two had a driving license. They needed information about the car manufacturing process, but had to simultaneously keep the project secret. A few visits were made to Nyköpings Automobilfabrik (later ANA), but as the extent of their work involved the simple installation of bodies on imported ladder frame chassis, the engineers were not able to gather as much information as they had hoped. Also, since all available literature only described how cars were made before the war, they realized that much of the manufacturing process would have to be learned on their own. Close to Saab AB’s factory a junkyard provided the engineers with both parts and inspiration. They also purchased a number of cars to study, including a DKW, a Hanomag, an Opel Kadett and a Volkswagen. Structural integrity concerns led to other design decisions. The team tasked with that portion of the project was used to building aircraft where every opening was covered with a load-bearing hatch. 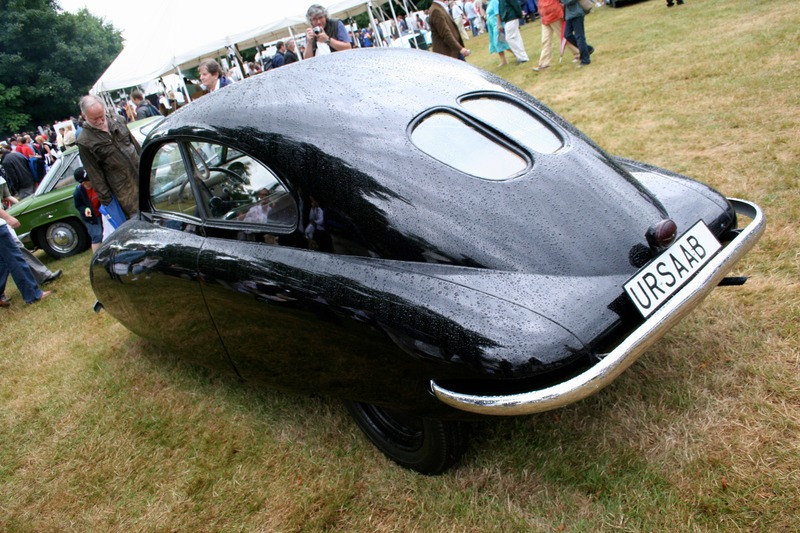 Since this was not viable on an automobile, it was decided that the body structure should be strengthened through the use of a rear window that was as small as possible and which used a split-window design, and omission of a rear boot (trunk) lid. Because the car had to have a very low drag coefficient, aerodynamic tests were part of the early evaluations. Thus, the body was of novel design and, with safety in mind, it provided damage-resistance in the event of an accident. Winter driving capability was enhanced via front-wheel-drive and wide wheel arches which allowed for snow accumulation without obstruction of the wheels. Using some carpenters from Motala, a full sized mock-up in alder wood was built in the spring of 1946. The model was colored black using shoe polish. Some extra workers were recruited from Thorells Kylarfabrik in Linköping for building the steel body. Hand-shaping the 1.2 mm thick steel sheets proved to be difficult work. By summer 1946 the first prototype body was ready, hand beaten on a wooden jig. Shaping of the metal was done in Saab’s secret factory 30 meters below ground. The color proved to be a problem. The managing director wanted it painted black, but the vice director wanted it blue. However, the workshop had already purchased black paint, making this a moot point. The Saab AB paint workshop did not have the capacity to handle the paint job so the builders contacted Aktiebolaget Svenska Järnvägsverkstäderna (ASJ), the Swedish railroad works in Arlöv. This firm was experienced in painting railway cars and buses. Having been told that their assistance was needed in painting a car, the company was initially reluctant to help since it was thought that the vehicle was a management car such as a DeSoto or something that would take a lot of time. However, when it was learned that the vehicle was a prototype of a new car, ASJ quickly took the job. 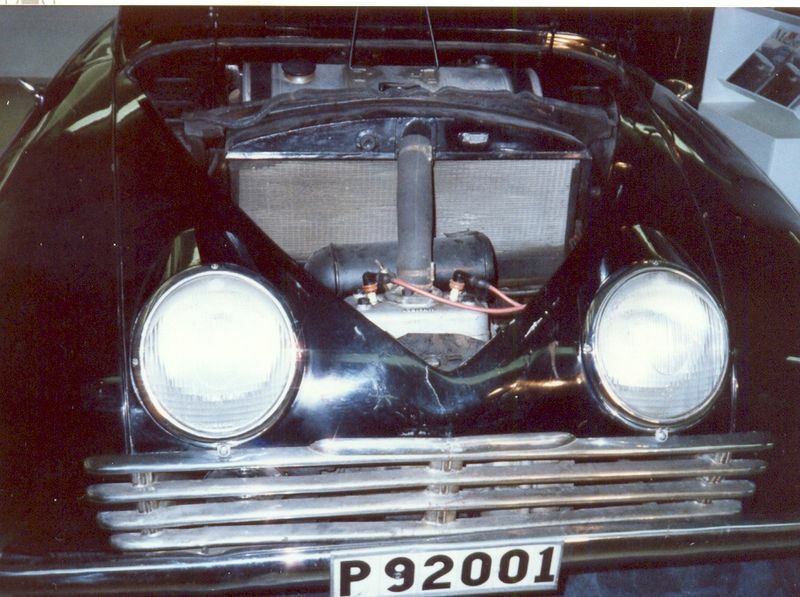 The prototype had a borrowed 13 kW (18 hp) two-cylinder two-stroke engine, which was placed transversely in the front of the vehicle. The first engine and gearbox came from a DKW vehicle, but they were later replaced with an engine and gearbox designed by Gunnar Ljungström. The prototype engine blocks were made by Albinmotor. The head of the firm, Albin Larsson, was hesitant to take work since the cooling pipes in the engine block were considered to be complicated. After test driving the prototype, however, Larsson changed his mind. Ursaab was driven over 530,000 kilometers (330,000 mi), typically in utter secrecy, and usually on narrow and muddy forest roads and in early mornings or late nights. Today it is in the Saab museum in Trollhättan, with a polished grille and more modern headlights. Linköping where the prototype Ursaab was developed is in Östergötland where pearl barley is a traditional staple. 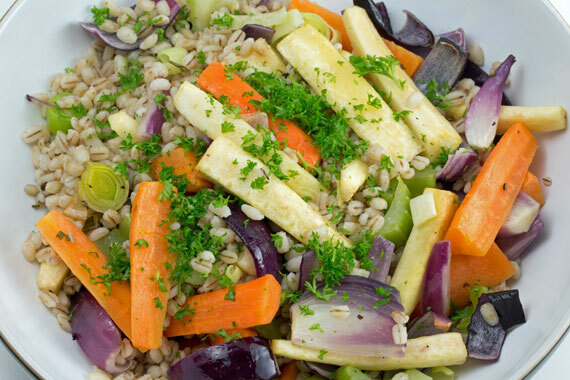 Korngryn och rotsaker (pearl barley with root vegetables) is a classic dish served either hot or cold. I can’t quite understand why southern swedes make so much over this dish because it seems so ordinary and bland. But I suppose, that’s how I would describe Swedish cuisine in general. Hot this dish may accompany lammstek med timja-rödvinsås (roast lamb with a red wine sauce), or, it can be served cold as a salad dish when tossed in some olive oil and balsamic vinegar. Rinse the pearl barley thoroughly by placing it in a sieve and running it under cold water. Bring 2 cups of salted water to the boil, add the barley, cover, and simmer gently for 25 minutes. Check for doneness. Cook more and add a little more water if needed. When the pearl barley is cooked, pour it into a sieve, rinse under cold water and drain. Heat the olive oil and butter in a preheated 400°F oven for about 5 minutes. Add in the garlic and rosemary. Stir the aromatics around in the oil, add the vegetables and toss them so that they are coated with the seasoned oil. Season to taste with salt and pepper. Bake for about 20 minutes, then add the drained pearl barley and continue cooking until everything is a golden color. Serve warm garnished with parsley, or leave to cool, chill, and serve tossed with a little extra oil and balsamic vinegar.